Chef Obe is back for yet another installment of Food For Feet. This time around, he cooks a dish close to the heart of any blader who cuts back on grocery costs to buy a set of wheels—Top Ramen. The Blader Bum lifestyle can get expensive. Eating is a must and as a “starving artist,” cheap is the way to go. Four packets of Top Ramen for a $1 can mean a day’s meals are handled. Breakfast, lunch, dinner, and an extra packet for fourth meal (if you get the midnight munchies). Moderation is the healthiest choice for everyone, because too much of anything can be bad. 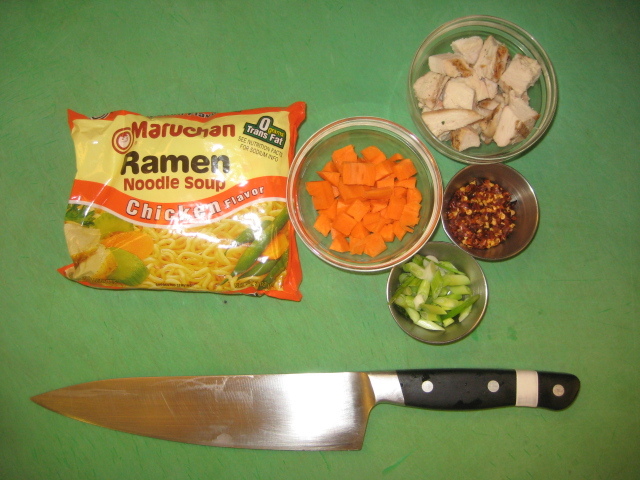 There are ways to spice up this Japanese noodle soup while avoiding the high sodium content found in the seasoning packets. A limited amount of sodium, or salt, is good as it retains water in the body by regulating H2O in blood vessels. Too much can raise blood pressure damaging your heart and kidneys, essential body parts needed for blading. If you don’t care what happens later, think about this: sodium constricts your blood vessels, thus making it harder for oxygenated blood to reach your muscles. Salt makes your skating worse. 1. Try using half of the seasoning packet. If you want more flavor, go for the whole packet. Just make sure you drink a lot of water throughout the day to balance the water to sodium ratio in the body. 2. Ditch the packet. Top Ramen doesn’t have to be a soup. The crispy uncooked noodles can be smashed and added to mixed greens to make a Top Ramen salad. The crunchy noodles add texture to limp leaves. The darker the lettuce, the more nutrients and vitamins. 3. Drain the noodles after cooking and toss your noodles with anything found in the pantry: teriyaki marinade, Frank’s Red Hot, etc. 4. 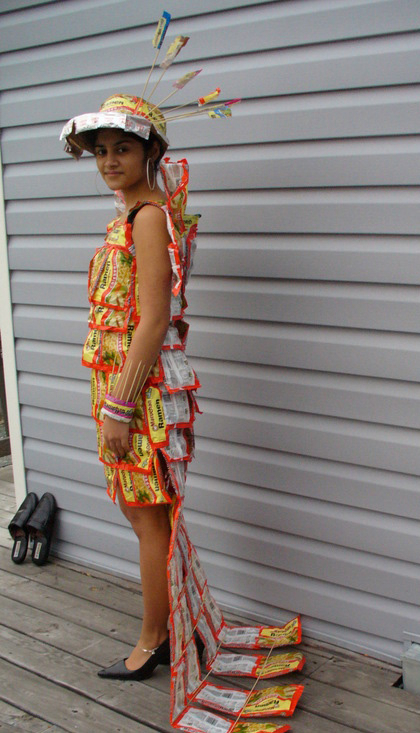 Make a cool outfit with the empty wrappers. 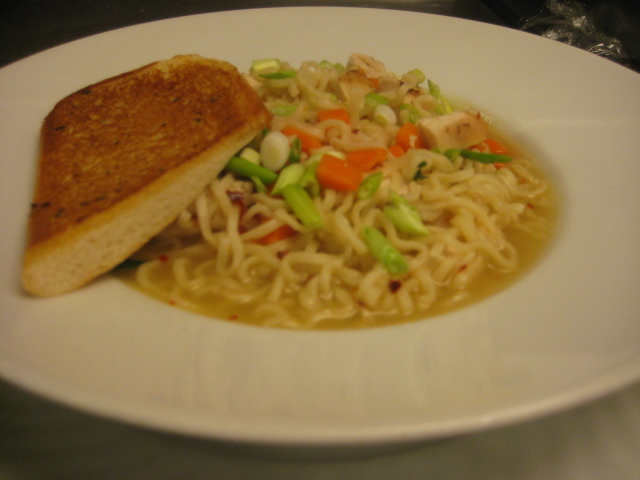 Everyone has ingredients in their pantries or refrigerators that can flavor the Japanese noodles. As a chef, I hate seeing food go to waste. 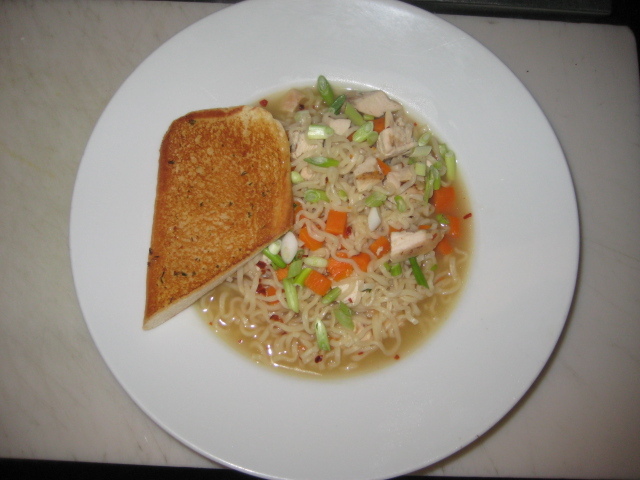 Adding things in my refrigerator that are getting old to a warm bowl of soup is the way I enjoy my Top Ramen. Some vegetables that are nearing their end point, Popeye’s Chicken from the night before, and a few chili flakes just to spice things up. It doesn’t have to be these exact things but, thinking outside the plastic wrapper with your Top Ramen is your healthiest choice. Top Ramen Chicken Flavored Noodle packet 1 Ea. 1. Bring water to a boil and add seasoning packet to water. Add carrots for 1 minute. 2. Reduce heat to a mild simmer, drop noodles and ensure they are submerged. 3. Heat for three minutes and add cooked chicken to broth. 4. Once noodles are al’ dente (Italian for “to the tooth”), add sliced green onions and chili flakes. 5. Transfer to a bowl and eat soup hot. 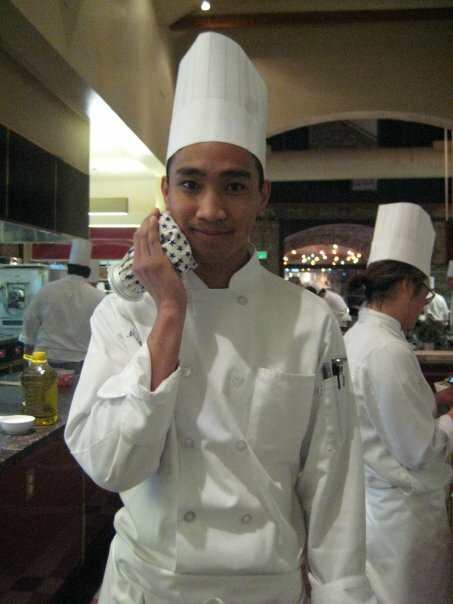 Michael Obedoza lives in Carson, Calif., and is a 2009 graduate of the Culinary Institute of America. He is sponsored by Valo and Eulogy. Check out his skating in the upcoming videos 4Life and Fade Nation Green. Check out his blog, Blading with Chef Knives. Nice blog Obe!! Is that a piece of Oak Creek Garlic Toast? Don’t lie to me……. @chef ted thanx boss. Yes that is an oak creek garlic toast. I better not be seeing a write up anytime soon.